Bersi Honey-Hand is the Nord owner and vendor of the general goods store Pawned Prawn in Riften. His wife Drifa lives in the store with him. A former sailor, Bersi used to own a fishing boat, which he named the Brawny Prawn. After selling his boat, he named his shop to commemorate his former life. Like many other citizens of Riften, Bersi is concerned about the rampant corruption within the city. Unlike most, he believes in improving the morality of the citizens through worship at the Temple of Mara. This has earned him the ridicule of many other citizens, who are convinced that the corruption runs too deep to be removed with prayers. His efforts to spread the teachings of Mara often bother his wife, who often laments, "My husband Bersi will be the death of me. He spends too much time worrying about the city, and not enough about himself." During the Thieves Guild quest Taking Care of Business, you are sent to retrieve protection money that Bersi owes the guild. He will agree to pay after being beaten in a brawl or after you destroy one of his prized possessions, a Dwemer urn. Bersi will begin his day at 6am, having breakfast for two hours. From 8am until 1pm he will man the store, until sitting down with his wife to have lunch at 1pm for an hour. He will then man the store until 6pm, then have dinner for an hour. After this, he will roam around the Riften market until 11pm, browsing the stalls, sitting on the benches, and occasionally using the armor workbench next to The Scorched Hammer. From 11pm to midnight, he will stand at the counter in The Pawned Prawn, and at midnight he will go to sleep. 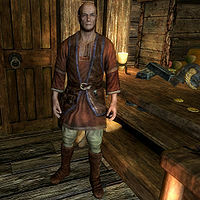 Bersi wears a set of merchant clothes along with a pair of boots. He carries his key to the store, a belted tunic, and a selection of common loot and gold. In combat, he relies on a leveled dagger which can be up to elven in quality. In his shop, he will greet you with, "Welcome to the Pawned Prawn. Come on in, take a look around." When speaking to him, he may say the following things: "Welcome to the Pawned Prawn. What can I do for you? ", "I have all sorts of interesting items for sale. Have you looked around? ", or "Pickings may be a bit slim today, but if you see anything you like I'll make you a good deal." Should you meet him outside his shop, he will invite you to the Prawn: "If you're looking for anything to sell for a fair price, I run the Pawned Prawn over by the market." He will concur as you remark that his shop has a most unusual name, saying, "Catchy, isn't it?" and explain its origin: "In my youth I was a fisherman... I had a beautiful ship named "The Brawny Prawn." But the years have a way of creeping up on you. I ended up selling that ship to open this place. Seemed only fitting to name it after her. Well, changed it a bit I suppose. If I had been smarter, I would have kept my boat. Coming to this city was a big mistake." If you ask about what's wrong with Riften, he will bitterly reply with, "The question is, what isn't wrong with Riften. This city is corrupt. Rotten to the core. No one cares about anything except themselves and how much coin they can make off the misery of others." Suggesting that maybe he should speak to the authorities, Bersi will further describe the city's degeneracy: "Authorities? Have you been listening to what I said? They're all dirty. Every one of them. The only way to get things done in this city is to keep your head down and pay off the right people." Bersi will tell about the Thieves Guild if asked about it: "They used to be pretty feared around here. I mean, you'd whisper the name and it'd send chills down your spine. Now, they're nothing more than ruffians and thugs trying to pry a few extra coin from honest people. All it would take is a small force of guard to go into the Ratway and flush them out." You can further ask him about the Ratway, to which he will reply, "It's our name for the old sewers that run under the city. It used to be a huge system hundreds of years ago but it fell into decay just like the rest of Riften. The Guild stocks the place full of thugs that aren't good enough to join, so watch yourself if you venture down there." Bersi Honey-Hand: "Drifa? I was looking through our books and there's an entry for "spices." [sic] Says we spent 300 septims. What is that?" In Patch 1.5 Bersi was added to a new CR08ExclusionFaction, preventing him from being a radiantly-selected victim for the Rescue Mission quest. If Drifa is killed, Bersi can sometimes be seen wearing an Amulet of Mara. He is marked as a confidant to Lynly Star-Sung despite no apparent connection between the two. He is at least acquainted with Wilhelm. The letter "An Apology" implies Bersi had previously asked him to loot Shroud Hearth Barrow for any ancient Nord artifacts to sell. This page was last modified on 21 June 2014, at 12:39.